Tri-Cast are very pleased and proud to announce the launch of our latest ground breaking pole. Welcome to the TROPHY X TYPE 80. Constructed on the same mandrill as our Flagship pole, the EXCELLENCE PRO. This new pole has all the technology and design features of the EXCELLENCE. The Carbon is slightly different and the way that the multilateral fibres have been laid out have altered slightly due to a new super light Resin. This has resulted in a very responsive, stiff pole with an abundance of power. Extra wraps of material within the larger sections has helped the overall balance of the pole and makes it a dream to use even at very long lengths. We have super reinforced wraps on the joints to eliminate wear and ensure each section has a long life span and combined with our super slip finish, which makes the pole smooth to ship in and out, it really is a dream to handle. A fantastic new pole which we are proud to put our Tri-Cast name to. 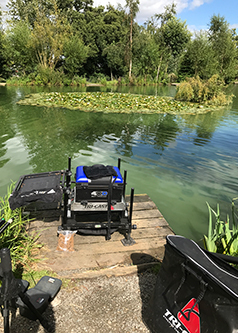 Supplied with our usual massive spares package which will cover all styles of match angling, but as always we are here to try and accommodate every angler’s personnel preferences and therefore a spares package by can individually tailored for each angler. Just let us know the package you require and we can re work it for you. The pole and all the spares comes supplied in a Deluxe Holdall and the corresponding tubes to keep this valuable piece of equipment safe and protected. PRODUCT LENGTH WEIGHT ELASTIC RATING R.R.P. S.S.P. PRODUCT ELASTIC RATING R.R.P. S.S.P. TRI-CAST NUMBER THEIR SECTIONS DIFFERENT TO OTHER MANUFACTURERS. OTHER COMPANIES NAME THEIR FLICK TIPS A NUMBER ONE BUT WE NAME IT WHAT IT IS , A FLICK TIP. SO THEREFORE OTHER COMPANIES SHORT FOURTH SECTIONS ARE THE SAME AS OUR INTEREX SHORT NUMBER 3s. HOW DID THE TROPHY X TYPE 80 PERFORM IN A MATCH SITUATION. Fishing at Weston Pools I found myself on Peg 25 on Belverdere. Now for those of you who don't know the fishery or this peg, then you should know it is a stunner with a large patch of thick Lilly's at 13 Mtrs and two nice margins. 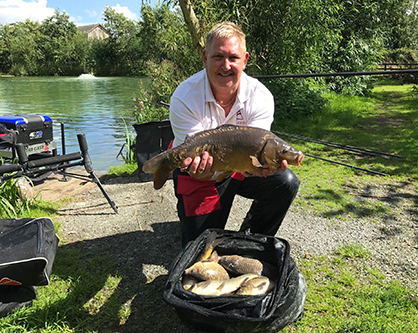 You will catch large Carp (over 10lbs) and good 3 to 5lb F1s along with large Barbel The hardest part is to keep them for going into the Lilly's therefore you need to gear up. So I set my stall out with Black Hydro and 9lb Guru Line and 7lb hook length. Size 16 wide gap hook and banded a 6mm pellet. Feed 4mm pellets Fished shallow just short of the pads and also tight in the margins. The pole never missed a beat. Handled everything I caught, the biggest been a Carp just short of 12lb I was very impressed with how it performed and the way it felt. Shipped in and out smoothly and was a joy to hold. Very responsive and even the smaller stockies and Crucians bites were hit with ease. Had a great day and was pleased I used this pole. Ended up weighing just over 150lb and had no problems at all. At its price range this pole is in a class of its own. I am a firm believer that I cannot recommend something that I would not be happy using myself, but this pole I would be very pleased to use. Please go check it out.